John Billington was a Mayflower pilgrim, and a signer of the Mayflower Compact, who became America’s first murderer after he shot and killed a fellow colonist in 1630. Billington was born in England about 1582. In 1603, he married a woman named Elinor Lockwood and had two sons: John, who was born in 1604 and Francis, who was born about 1606. The Billington family lived in Lincolnshire. According to the book The Human Tradition in the Atlantic World, the Billingtons were poor and faced limited prospects in overpopulated England. When the Billington family boarded the Mayflower in the late summer of 1620, they discovered their fellow travelers were a large group of religious Separatists from Holland. The Billingtons were devoted members of the Church of England and realized they had nothing in common with these religious dissenters. Little did they know that when the organizers of the trip, a Separatist church exiled in Holland led by John Robinson, tried to originally recruit church members for the trip most of them were reluctant to join due to the harsh contract terms, the danger of crossing the ocean and the untamed wilderness of America. When the recruiters failed to find 150 volunteers among its church members, they began to recruit non-Separatists like John Billington in order to secure enough volunteers. Billington and some of the other non-Separatists also started to cause trouble when the ship landed in New England, where they did not have a patent to settle. The author of The Human Tradition in the Atlantic World states that these protests came from colonists like Billington who were eager to walk away from the strict contract they signed and wanted to avoid living in a society dominated by anti-Anglican religious separatists. 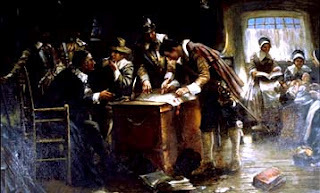 Despite signing the Mayflower Compact, which was a social contract the colonists signed in early November in which they promised to obey the colony’s laws, Billington continued to cause problems in the colony. In March of 1620, Billington insulted the colony’s military adviser, Miles Standish, when he challenged his authority and was sentenced to public humiliation by having his neck and feet tied together. In 1623, the colonists divided the available land and John Billington was awarded three acres. Technically, he should have received four acres, one for every member of his family, but it appears that his son, John, was living with Richard Warren at the time and, as a result, Billington only received three acres while Warren received one extra acre. In 1624, Billington got into trouble again after he was accused of secretly supporting local dissenters who had been sending political letters meant to undermine the colony back to England. Billington insisted he was innocent and since there was no proof that he was actually involved in the conspiracy, the colonists could do little about it. In 1626, the colonists assumed full ownership of the plantation after a period of negotiation with the investors who were disgruntled because they had received very little profit from the project. The land and cattle were divided up among them but for Billington, it wasn’t quite what he was expecting. Billington received the smallest per capita allotment in the colony, despite the fact that he was one of the first settlers of the colony. He received a house in the center of Plymouth, 63 acres of land, a share in the plantation’s livestock and rights in future distribution. Billington didn’t have much of a social status in the colony either. He was not a member of the church, he had been excluded from all public office due to his bad reputation with Governor Bradford and he lacked the resources necessary to become one of the colony’s Undertakers, which were men who took on financial liability for the colony and controlled its trade with England. As a result of all this, Billington was frustrated and angry. To make matters worse, sometime between 1627 and 1630, Billington’s son, John, died just before he turned 25 years old. The cause of death is unknown but Richard Warren also died in 1628 which indicates there may have been an illness in the Warren household. John Billington was hanged in September of 1630. Billington’s burial location is unknown, although he was probably buried on his property as per social custom at the time. The Billington family continued to get into trouble even after John Billington’s death. On June 7, 1636, Elinor was found guilty of slandering a man named John Doane, a church deacon and former assistant governor. She was sentenced to sit in the stocks, be whipped and pay a £5 fine. In 1638, she remarried to a man named Gregory Armstrong and died sometime between 1643 and 1650. Francis Billington married Christian Eaton in July of 1634. He received a few small fines in the 1630s and 40s for minor offenses but for the most part stayed out of trouble. He and Christian had nine children and lived in Plymouth until 1669 when they moved to Middleboro. They both died of old age in 1684. There’s a large shallow pond in Plymouth called Billington Sea. Apparently, this same gentleman had climbed a tree and claimed he saw a ‘sea’ to the west. The pond was named after his goof. John Billington Jr., was the founder of the Billington Sea. It was his father who was hung. I have heard of several ghost sightings on and around the Black Cat Rd. area assumed to be that of John Billington. Billingtons came from my Daddy’s side of the family! No Joke! I’m just found we might be related to him. John Billington is a direct ancestor of mine. I appreciate greatly the detail of your post. John Billington’s granddaughter Martha married Samuel Eaton, the son of Mayflower passenger and carpenter Francis Eaton. The Eaton line married into the Titus ancestral line in 1858 when Lucy Maria Eaton married my great grandfather Edwin Bristol Titus in Elizabethtown, New York. The ancestral line of another original Mayflower passenger, Samuel Fuller, connected with the Eaton line twice. Samuel’s grandson Samuel Fuller III married Mercy Eaton, the daughter of Samuel Eaton and Martha Billington. Samuel I’s great granddaughter Lydia married Francis Eaton’s great grandson Francis probably in 1734. They lived in Middleboro, Massachusetts Colony. One thing I learned from my genealogical studies is that if you are a descendent of one Mayflower passenger, you are the descendant of several — in my case five: John Billington, Francis Eaton, Samuel Fuller, Francis Cooke, and John Howland. This is due to the limited number and size of settlements that existed in the Plymouth Bay area during the 17th Century. Birth: John Billington was born in England about 1582. Death: He was hanged in Plymouth in September 1630 for the murder of John Newcomen. Life in England: Nothing is known about John Billington’s life in England. His son, Francis, was named in a lease of property in Cowbit, Lincolnshire in 1612 and either John or Elinor, or both, were probably associated with this area. Life in New England: John, Elinor and their two sons, John and Frances, came to Plymouth in 1620.The Billington family appeared several times in the accounts of early Plymouth Colony. Francis made squibs and fired a musket in the Mayflower while the ship was anchored off Cape Cod. He went exploring soon after their arrival, and discovered the body of water now called Billington Sea. His brother, John, got lost in the woods for several days, eventually being returned home from Nauset, on Cape Cod. John Senior challenged Myles Standish’s order in March of 1620/1 and was punished for it, the first of many confrontations. Finally, in 1630, he was tried and executed for the murder of John Newcomen, the first such execution in the colony. Family: John Billington married Elinor _____ in England. They had two sons. After John’s death, Elinor married Gregory Armstrong in September 1638. She died after March 2, 1642/3. Gregory Armstrong died in Plymouth on November 5, 1650. •John was born about 1604. He died in Plymouth between May 22, 1627, and his father’s death in 1630. •Francis was born about 1606. He married Christian (Penn) Eaton in Plymouth in July 1634 and had nine children. He died in Middleboro on December 3, 1684. Oh my gosh! I just found out I am related to him too! John Billington would be my 11th Greatgrandfather. His son, Francis Billington married Christian Penn. They had a daughter Martha b.1638 who married Samuel Eaton who was a baby on the Mayflower. His parents were Francis and Sarah Eaton. Sarah Eaton died in 1621. Francis Eaton then re-married to Dorothy who died shortly thereafter. Francis Eaton then married his third wife Christian Penn in 1626 and had 3 children together.Francis Eaton died in 1633, he would be my 10th greatgrandfather. Christian then married Francis Billington. So, Samuel Eaton and Martha Billington were step siblings! They had a daughter Sarah who married phili[p Bumpus. He is also my 11th great grandfather! I live in Rochester, NY. Thank goodness that good genealogical records were kept in Massachusetts Colony. It’s when ancestors moved out of Massachusetts, for Vermont to cite an example, that we ancestor-hunters have difficulties. I am a direct descendant of John Billington.My family still carries the Billington name.My mother is the eldest child of Dolly and Floyd Billington. Elinor and John are also my ancestors. Interesting in anything I can find about them. I like the sympathic narrative above. As an outspoken Anglican among Separatists I can understand his dilemma. I wonder if Bradford was pleased in his heart of hearts to rid the colony of this irritant. Does anyone know why John Billington Jr. live with Richard Warren? John Billington is my 12th great grandfather! Thank you! I’ve been wondering! This is such a reliable resource. My husband is a direct descendant of John billington. billington is his 11th grandfather. A billington daughter married a sabin who was one the founders of Rehoboth. The ancestry is grandfather to grandfather right down to my husband and his brother. my husband mother was a sabin. mayflower society published books 21 volumes. On the mayflower genealogy. MAYFLOWER and five generations out. these books are available on amazon. There is another book. History Rehoboth 1643 to 1800. Mayflower book published 10 yrs. Ago has several pages on billingtons. Hi to all fellow Billington’s. I’m one too. I’m not sure if I am related to any of the Mayflower passengers but I’d like to find out some day. My mother lived in Lincolnshire, England a while ago and I used to visit them from Southampton, England. I feel a strange affinity and coincidental longing for these places in me. Both places that John Billington had associated with. Spooky! and one of my cousins also researched this (am a descendant through my mothr’s father), and her tale was that a neighbor kept poaching on Billington, was warned about it by Billington and the ruler of the colony. When the neighbor kept poaching, Billington shot him in the leg. The wound turned gangrenous, and he eventually died. Since the neighbor died from the gunshot, it was called murder and Billington was hanged. I guess their was no defense of protecting one’s private property. That is substantially the same account my family has always been told. Newcomen stole one of John Billington’s pigs and Billington shot him in the leg or the shoulder. There’s a book called “Saints and Strangers” that has this account. When the pilgrims came here they agreed to all work for 7 years, that meant the children would work for others. John being the one to work for Warren. Wow, Great article and loved all the history. I just finally made my Mayflower Connection today and searched John and found your article. My grandmother used to have a book that showed my direct line and my cousin threw it out accidently after her died back in 1984. I kept chasing the wrong family line. Other direct grandparents are White and Eaton so I keep trying to bridge those gaps. I can trace most of my mother’s lines back to colonial days. John Billington is my 11th Great Grandfather, Francis being my 10th. Then Mary Billington my 9th Great Grandmother married to Samuel Sabin. Their son Israel my 8. My 7th Great Grandmother was Margaret Sabin married to Robert Otis. Their son Robert was my 6th married to Lydia Stafford. My 5th was his son John Otis married to Betsy Butler. Then this gets interesting because my 4th Great Grandmother is their daughter Aurillia Otis and also their son Franklin is my 4th Great Grandfather. Aurillia was married to Charles Beardsley and their son my 3rd Great Grandfather John O Beardsley married Franklin’s daughter Helen Otis. From John Beardsley and Helen, my 2nd Great Grandfather is Sheldon Beardsley. His son Leon Beardsley is my Great Grandfather and his daughter Naomi Beardsley is my grandmother. Thank you for this detailed article! Francis is my 9th Great Grandfather. I am just getting into the genealogy of my family and it’s all very interesting! Massachusetts has apparently always had a penchant for railroaling people! Anyone who has ever had the indignity to experience Massachusetts archaic courts knows that the willingness of those involved in the service of insuring justice often use the courts as a retribution circus for their entitled friends. According to Ancestry, JB is my 11th great grandfather through my paternal grandmother Marian Fuller. My daughter brought home a family tree project for school, and I didn’t know much about ours so I called my dad and he told me about John Billington and that we were direct descendants. We are Robbins’, and I was able to find Abigail (Cushman) Robbins married to Benjamin Robbins, I haven’t been able to been able to find much past Joseph Robbins II. I was able to find the Robbins name as one linked to the Mayflower, but I’d love to know the full connection. It seems there were quite a few Robbins’ though! WOW! I am a Plymouth resident born and raised but expatriated to Texas now. I LOVE THIS STUFFF! I used to go to the Plymouth public library (BTI – Before The Internet) and devour all of this same kind of stuff in the history room. My family is from Amanda Ramsdell lineage. There is so much to the history of the “Old Colony”..people don’t even know…what they teach us in school or the “thanksgiving” fairy tale barely scratches the surface! Thank you so much for putting this together so well. Great job! When researching Robert Lee Daniel of Virginia, my grandfather, John Billington popped up with statement that my grandfather was descendent of a Mayflower voyage. I had hoped that John Billington’s life would give further information on Robert Lee Daniel because the Mayflower passenger list has no one with name of Daniel.